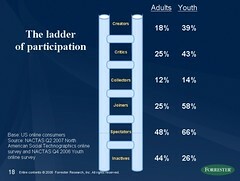 Left Image: Here’s some sample data that is derived from NACTAS 2007 North American Social Technographic Online Survey. Although I primarily rely on the proven Forrester Research methodology, when it makes sense, I tap into my network to discuss concepts and get examples. While only a part of methodology is evident to the public (what you see on this blog, or on twitter) this post will make it crystal clear what works –and what doesn’t. For all of my reports, I follow the research methodology that many other analysts have used before me for the past 25 years. This tested process may involve analyzing Forrester’s large technographic and consumer data banks, work with our data research team, conduct interviews, surveys, talk with clients (buyers), talk with vendors (sellers) discuss with fellow analysts, venture capitalists, and research online –it’s a thorough way to see the market holistically. As an analyst that covers Social Computing for the Interactive Marketer, it’s natural to use the very tools that I’m researching –in fact, it was one of the factors in how I earned the role. Using the tools is a great way to learn what works and what doesn’t, a key step before I make recommendations to clients. Also, this blog serves as a supplamant to clients as well as myself, for example I’m known for building many “industry index” lists in the space, it helps me to keep track of who’s doing what, and since I screen each submission, the signal to noise ratio is higher than a wiki. Also, Forrester reports are chockfull of examples of companies doing it right –and wrong. Given my network is tuned into what’s happening with brands and social media, I can easily get an answer if I don’t know it. It’s a direct example of using a social computer (and since my coverage is on social computing) this is a good fit. Of course, finding the examples is just the start, often, I need to understand the case study, and that often involves a typical research phone interview. For both of the above use cases. additional follow-ups and analysis are required. Asking my blog readers and twitter followers to provide broad responses that represent mainstream North America, Europe, or Asia isn’t effective. Fortunately, Forrester has a great deal of Technographic data (we’ve large data teams) at my disposal around user behaviors and consumer preferences –I don’t need to crowd source crowd source to get this, and rely on this for my data collection. I’m currently focused on a Forrester Wave of the online community platforms, this particular methodology does not call for any social media use –I’m using a tried and true methodology, learn more about it on the Forrester site. Sometimes, I engage in discussion on twitter that appeals to me personally: movies, music, events, art, sports, and occasionally politics. Being the curious individual I am, I’ve been known (before Forrester) to ask questions of my network and get responses –if’s a fascinating use of social media. Although some may not see the separation, it’s important to note that these discussions often have nothing to do with my role as an analyst. I primarily rely on Forrester’s data, process, and methodologies that have been tested and refined over the last 25 years. This includes input from our large survey data, interviews, client meetings, vendor briefings, and talking with fellow analysis. When it makes sense, I can rely on my large network of Interactive Marketers and Social Computing experts to flesh out concepts and find examples –although additional analysis is almost always required.